Embroidered garments are a very popular choice when looking to establish a quality corporate identity as it produces quality looking products with a professional, high-end appearance. 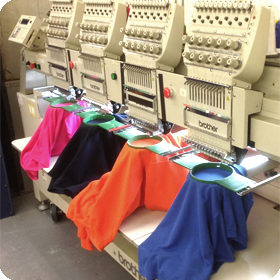 We can embroider any multi-coloured design in a number of different positions on garments, most suitably poloshirts, sweatshirts hoodies, fleeces, jackets, caps and hats. Embroidery really creates a stylish impression when combined with the right type of garment. To ensure a smooth production process, upon receipt of your design(s) we will create (digitise) a programme that samples the chosen image onto cloth for your approval before the order is complete. Embroidery costs are determined not by the colours, but by the number of stitches in the design. For quotations contact our experienced customer service team who will be able to provide you with a detailed breakdown of costs and as to how to proceed with your project.